Pictured: Charles Hurst Nissan Franchise Director, Alan Thompson with Ulster Farmers' Union Membership Director, Derek Lough. The all-new Nissan Navara has been named Pick-Up of the Year by leading title What Van? A stunning limited edition all-gold Nissan LEAF arrived into Belfast this week as part of a nationwide celebration of all Team GB athletes representing the nation at the Rio Olympic Games this year. Nissan has created a life-size origami Juke to celebrate the car’s fifth anniversary. Can you spot the difference? The Nissan Pulsar is a great choice for transporting students as they start University. With great space options the figures all add up! 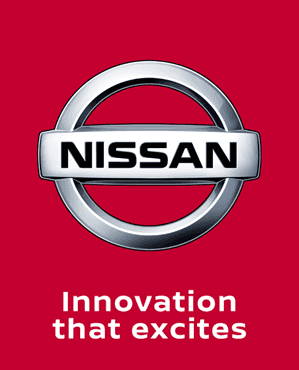 With over half a million vehicles sold in the first 8 months of this year, Nissan continues its massive success story. THE Nissan Qashqai, available at Charles Hurst Nissan, has been named the safest small family car by independent testing organisation Euro NCAP. Nissan have created the world's largest ever Zorb with a Nissan Note inside to highlight the effectiveness of their Safety Shield technology. After its successful launch in Europe earlier this year, the New Nissan X-Trail has been awarded the maximum 5 stars by independent safety organisation EuroNCAP. Nissan is continuing its developments to the all-electric LEAF, and the incoming model variation will sport a new design and significantly improved range. Nissan is set to introduce a new player to the hot hatch market with a tuned version of its Pulsar heading for production. Nissan’s ambitious plans for the future include producing a self-driving road car as soon as 2020. The pledge was made by CEO Carlos Ghosn during a speech in Japan, and the short time span reflects the manufacturer’s desire to be the first to offer such technology. The 2014 Auto Express Awards have now been claimed by manufacturers and their vehicles – and Nissan can boast a pair of wins this year. Drivers considering taking their Nissan on holiday this summer can be reassured by Nissan’s developments in safety systems for their European cars. The advantages of the Lane Departure Warning system have been brought to the fore, and customers can find the technology within the new Note. As a key investment in Nissan’s Sunderland plant kick-starts production of the new Juke, the manufacturer has announced the creation of 50 new jobs. Another addition to the continued technological advanced by Nissan is NissanConnect NISMO Plus, which enables drivers to record data from their lap of a track and analyse their own driving. On June 21 and 22, 2014, a line-up of star Nissan race drivers from around the world will attempt the iconic Nürburgring 24 Hours endurance race. At the Tow Car Awards 2014, the all-new Nissan Qashqai has been named as the ‘Overall Winner’ – scooping the most coveted award of the night.